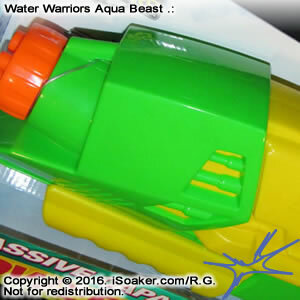 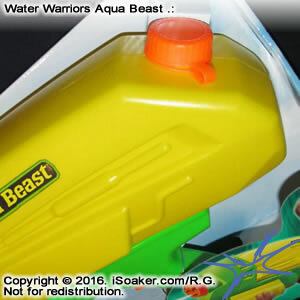 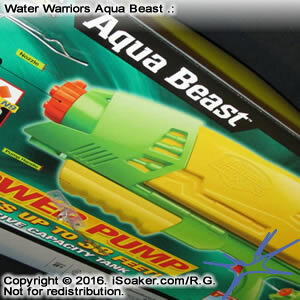 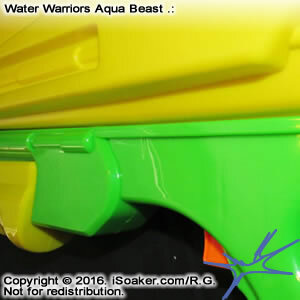 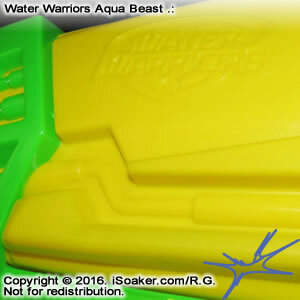 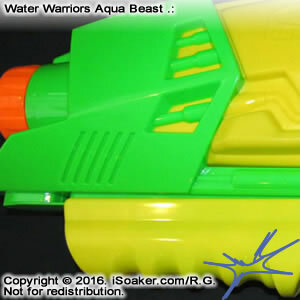 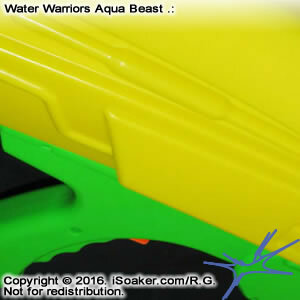 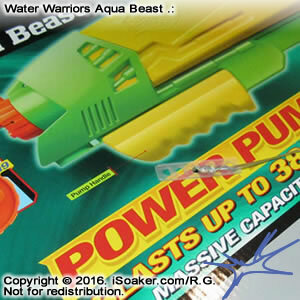 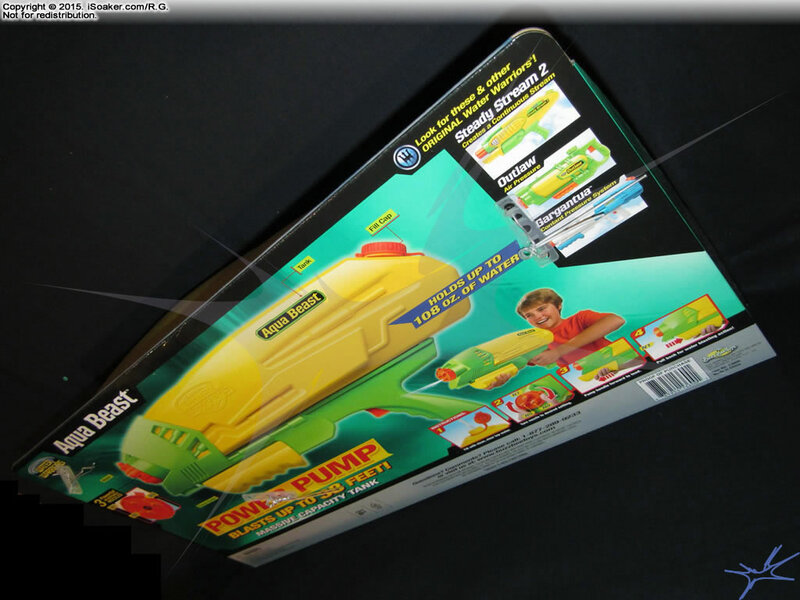 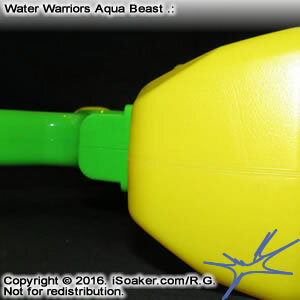 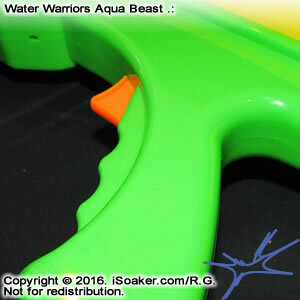 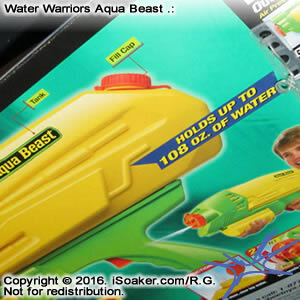 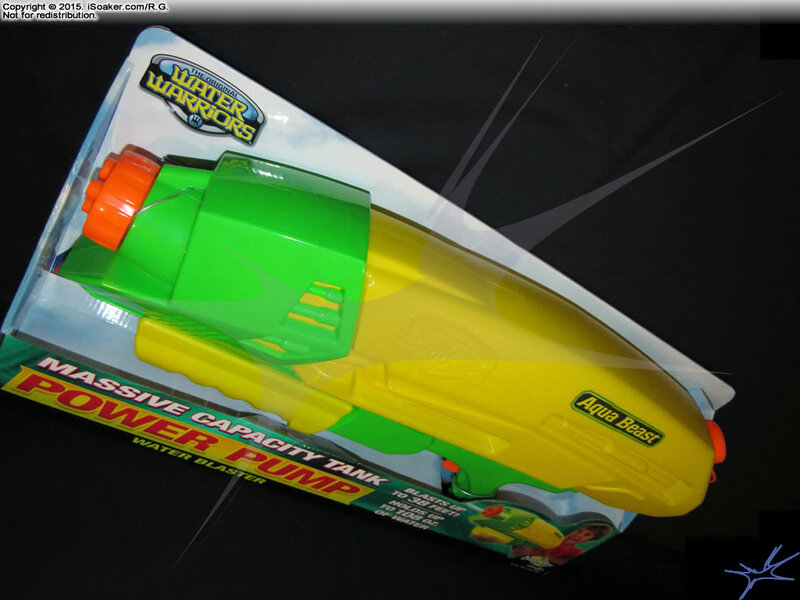 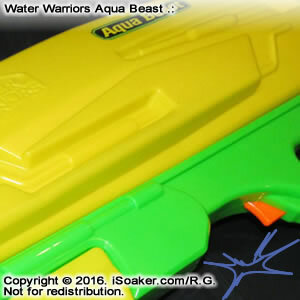 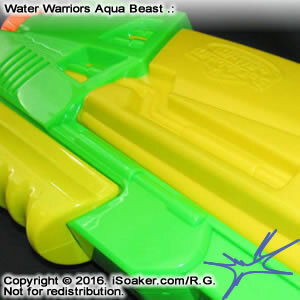 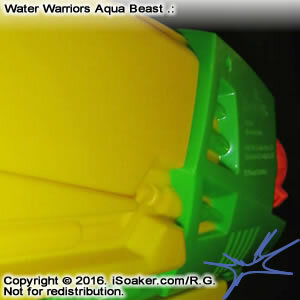 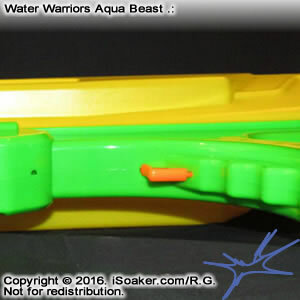 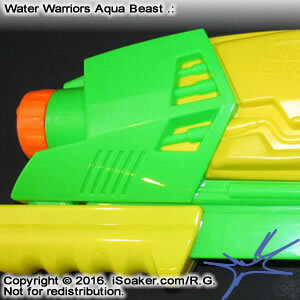 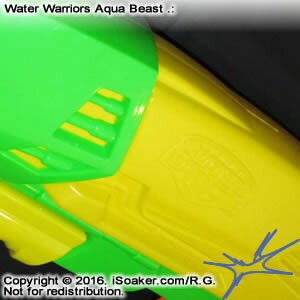 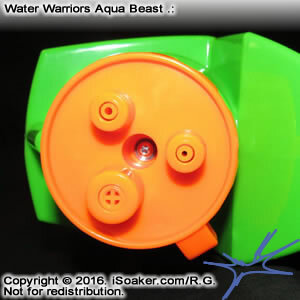 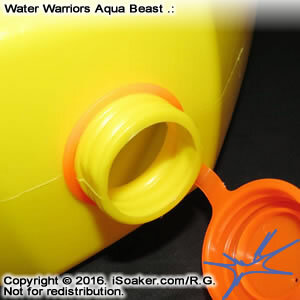 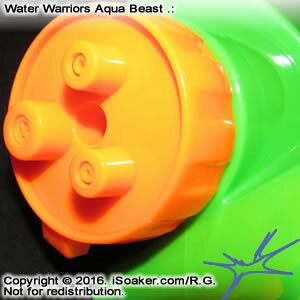 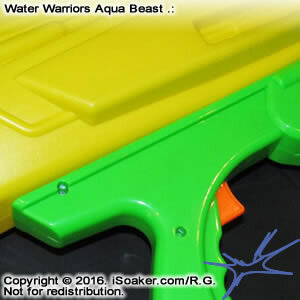 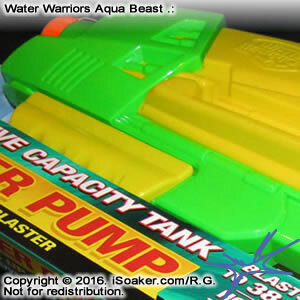 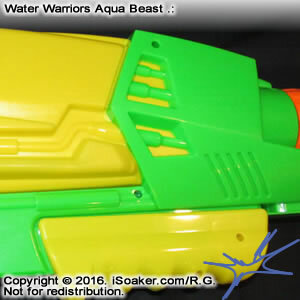 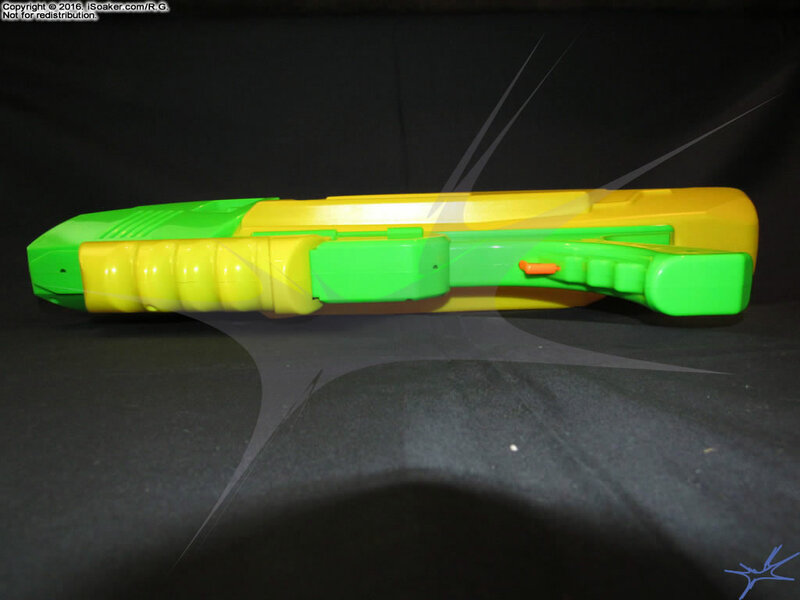 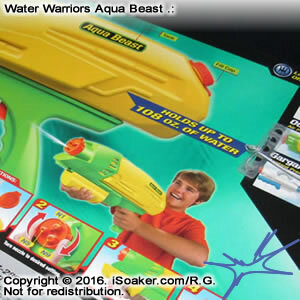 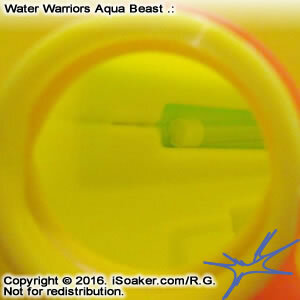 The Water Warriors Aqua Beast is a large new pump-action water blaster by Alex Brands Buzz Bee Toys Holdings for 2016. 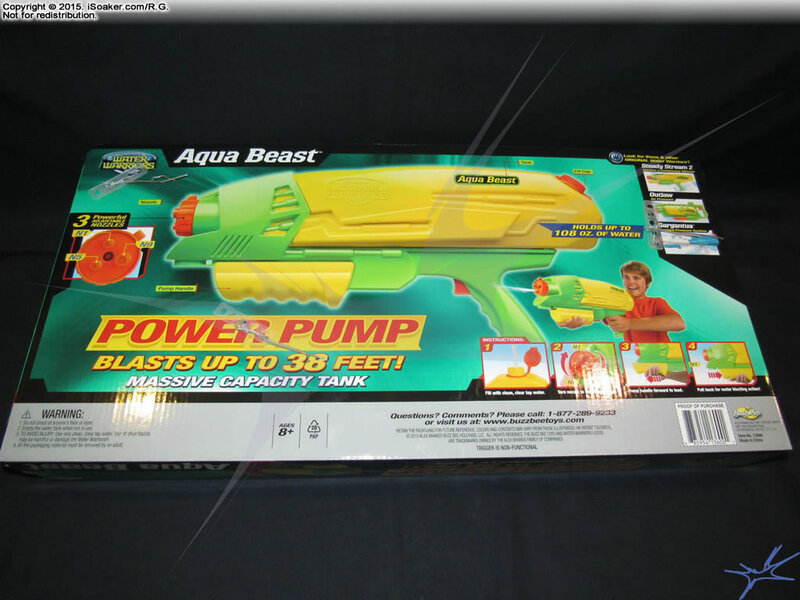 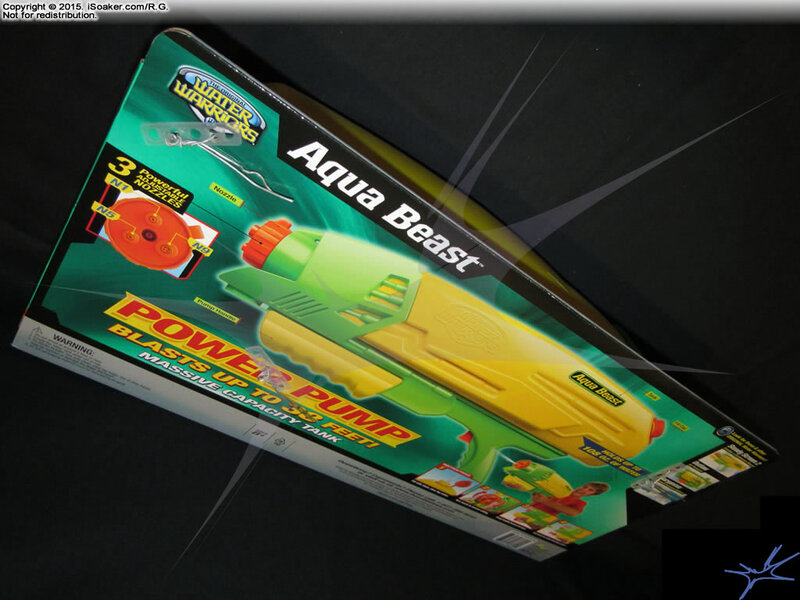 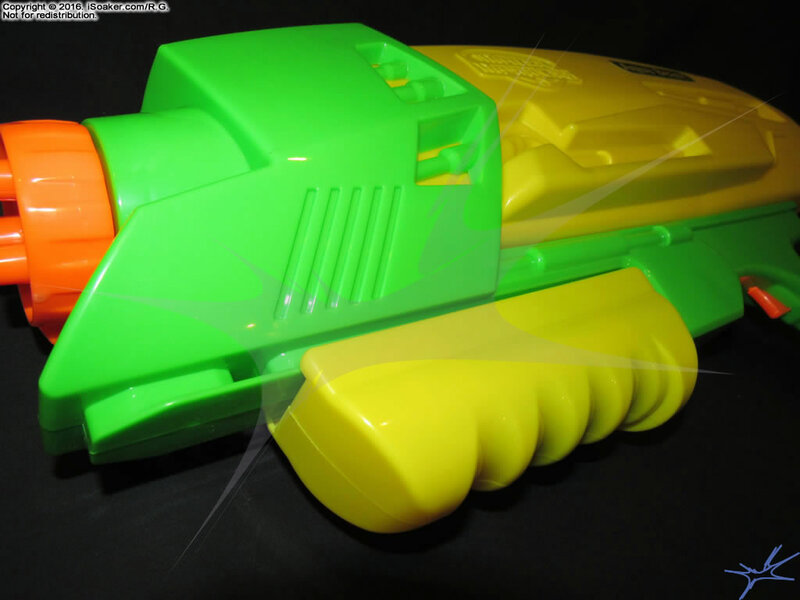 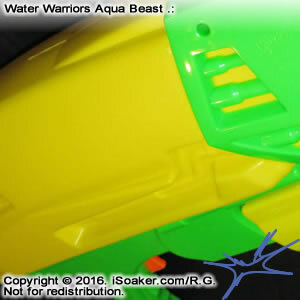 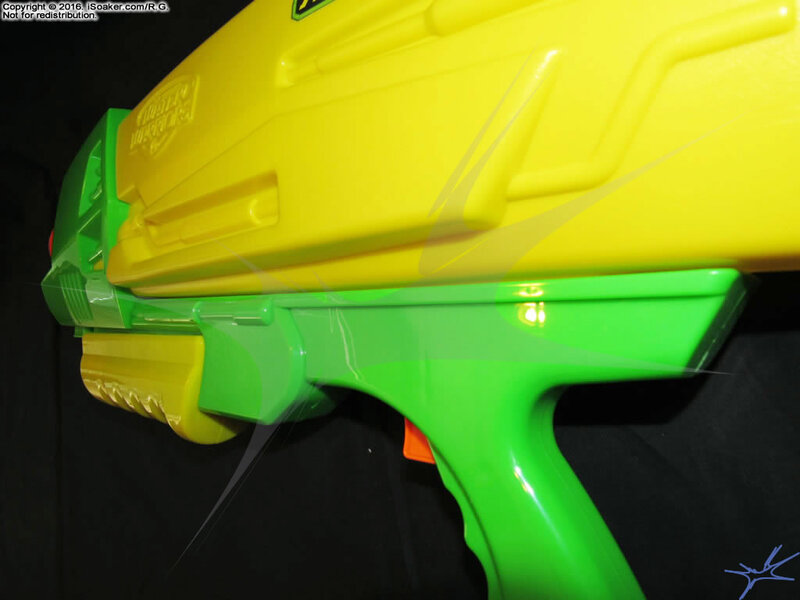 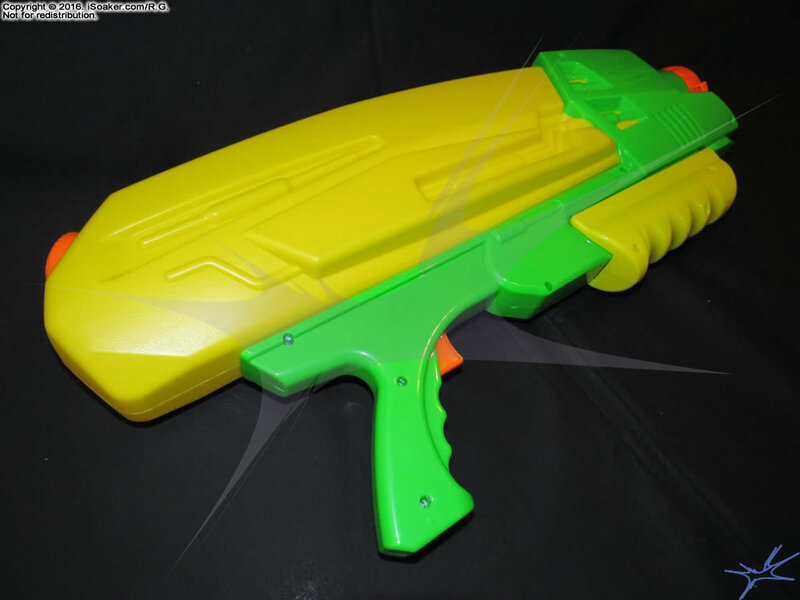 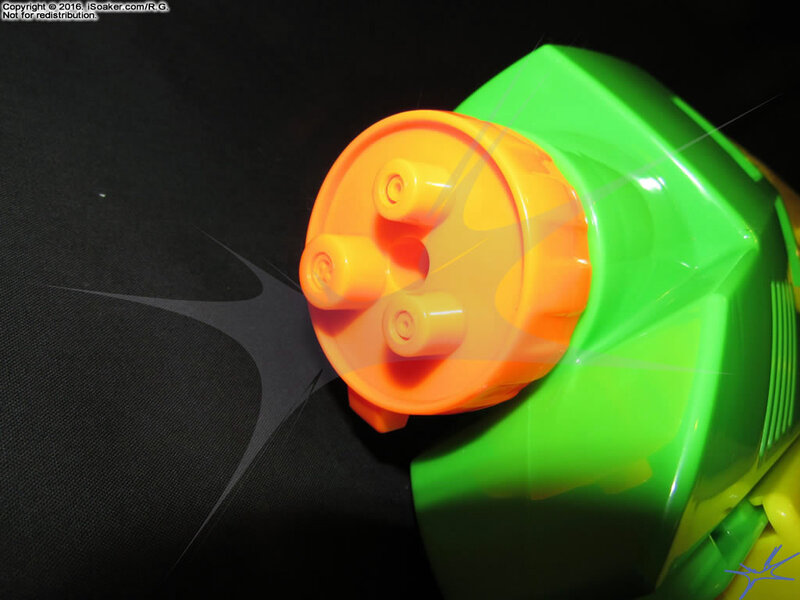 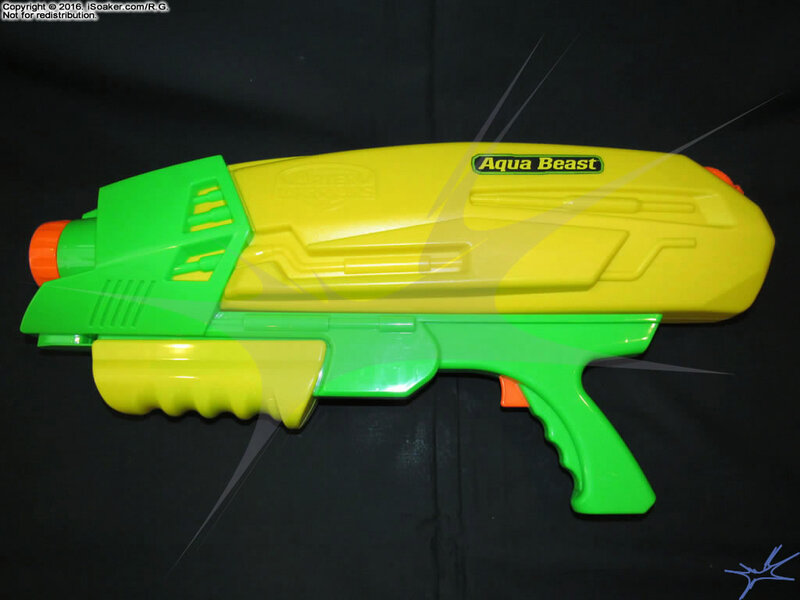 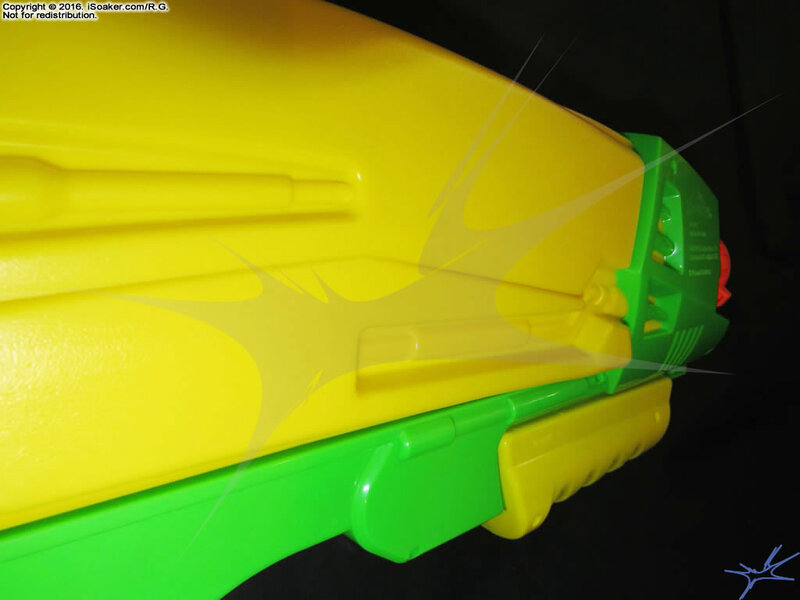 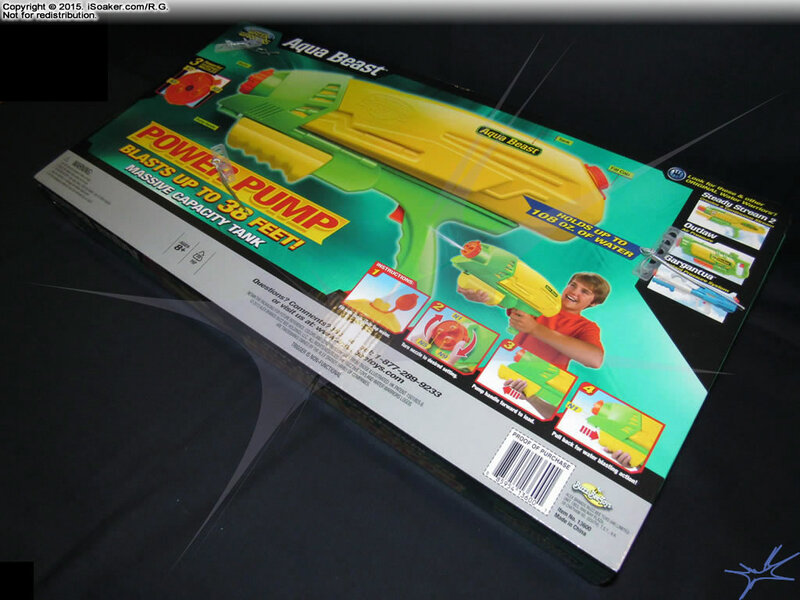 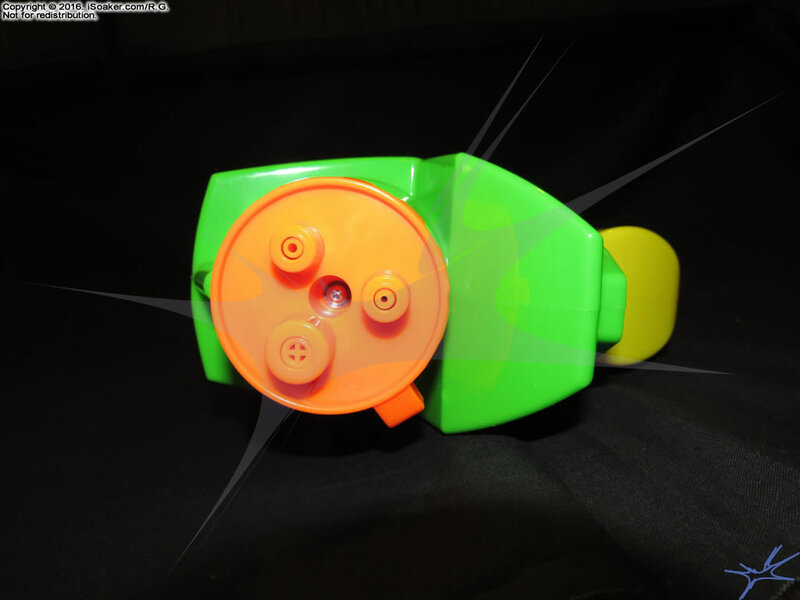 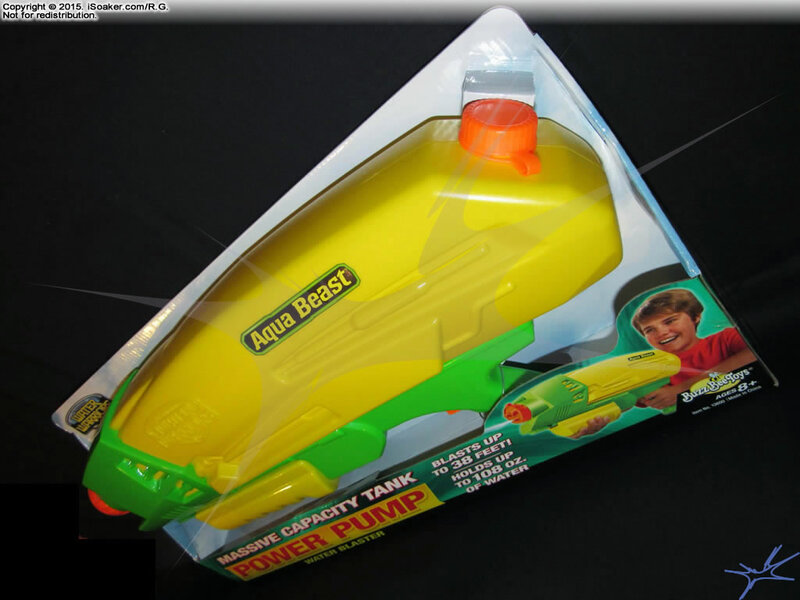 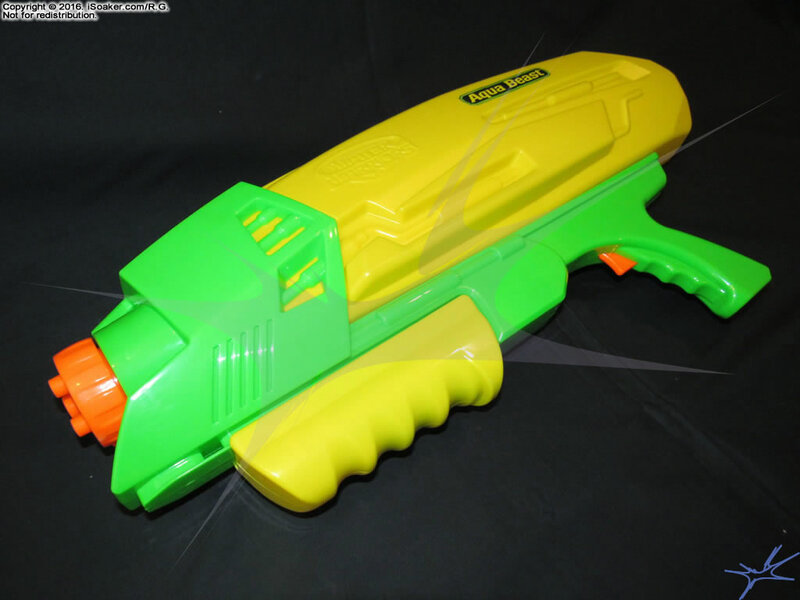 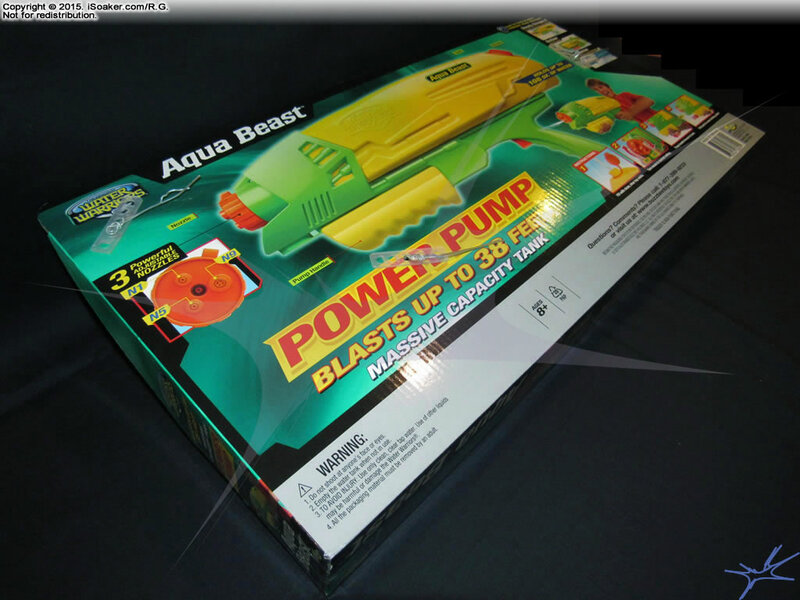 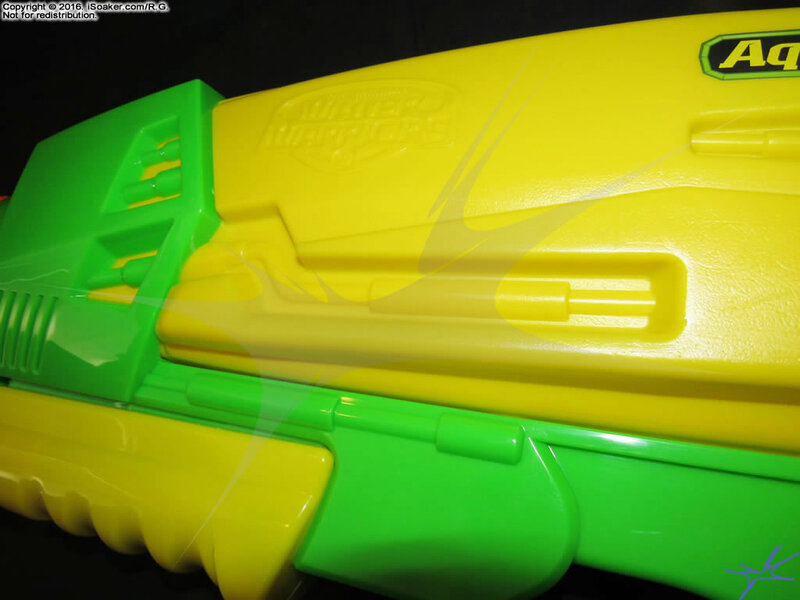 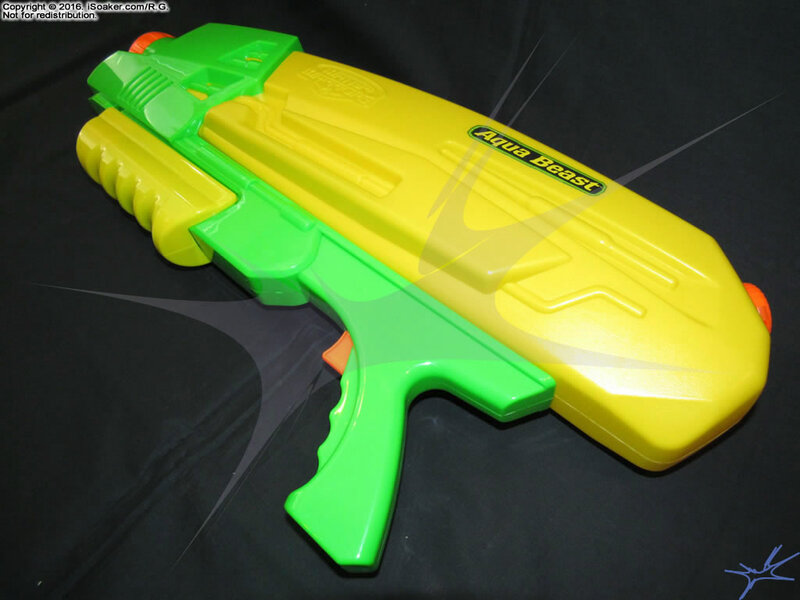 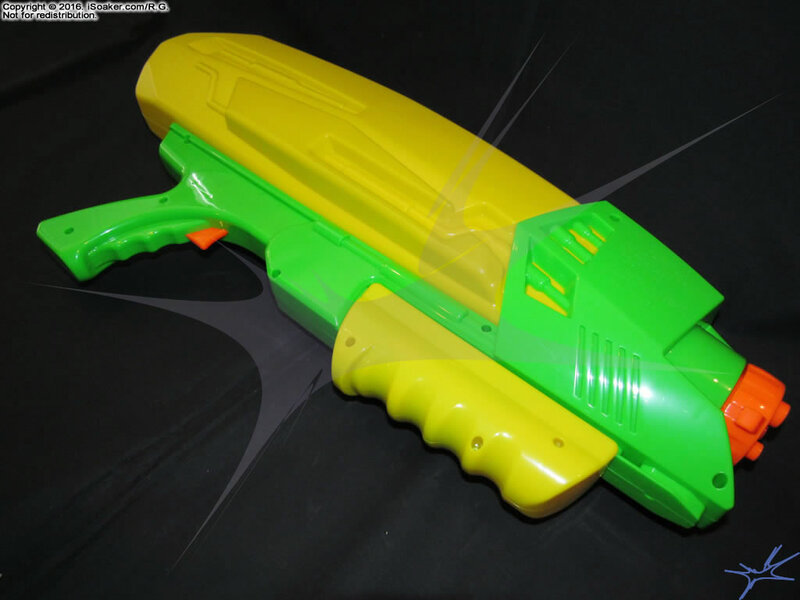 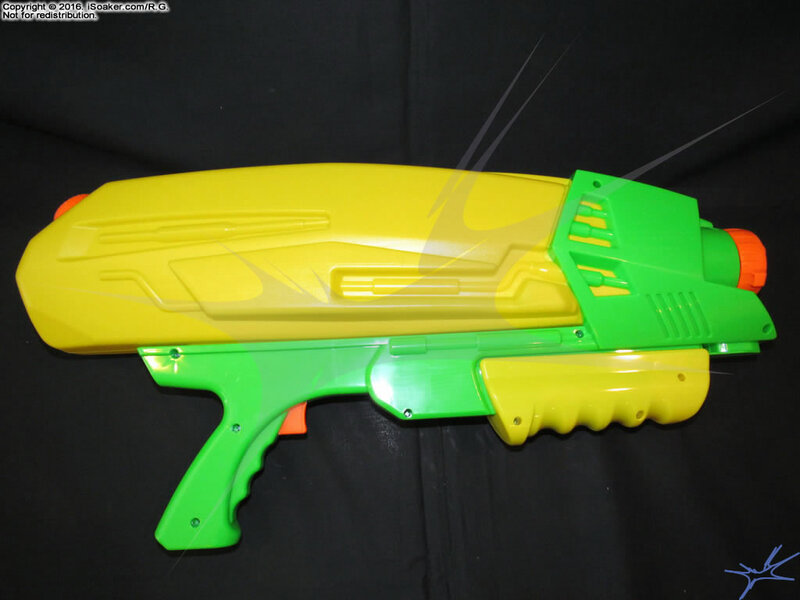 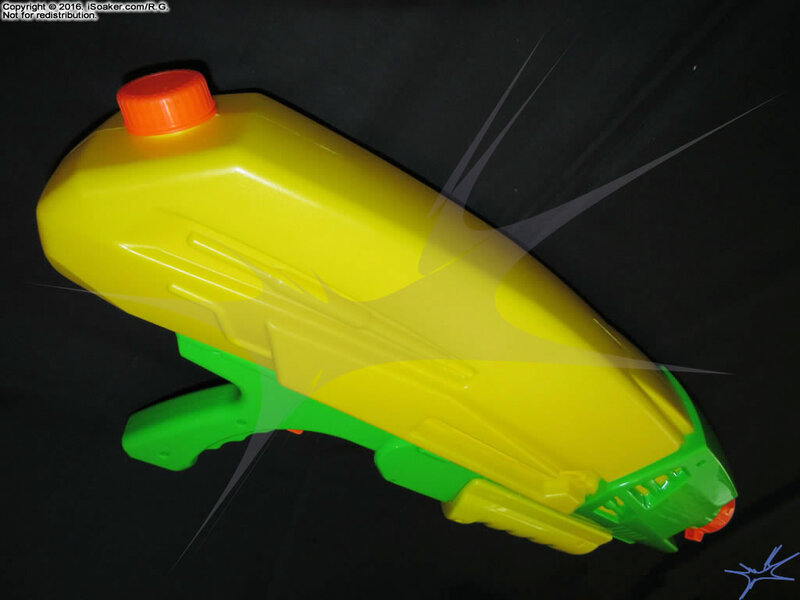 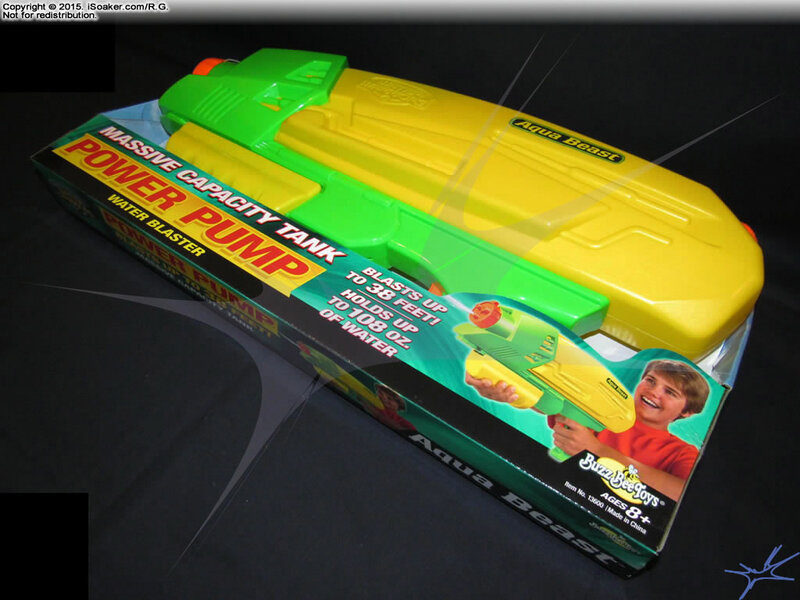 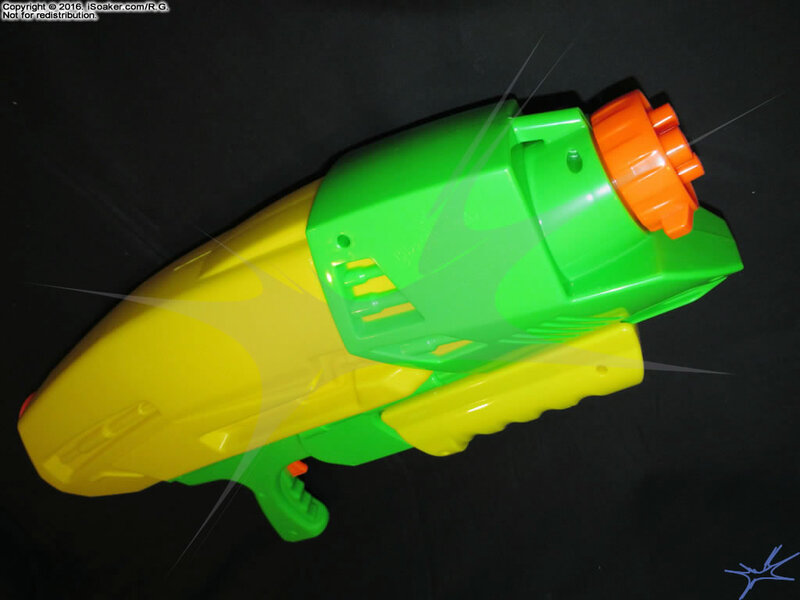 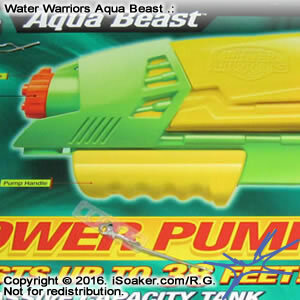 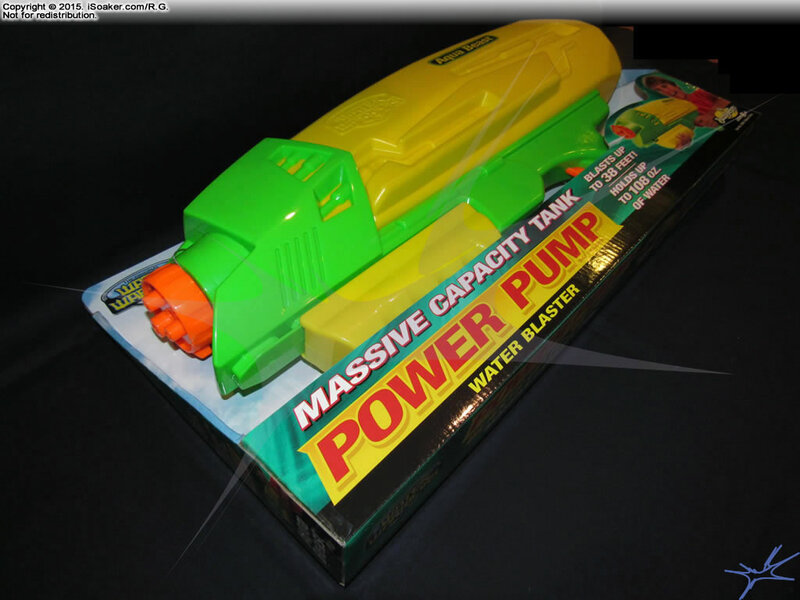 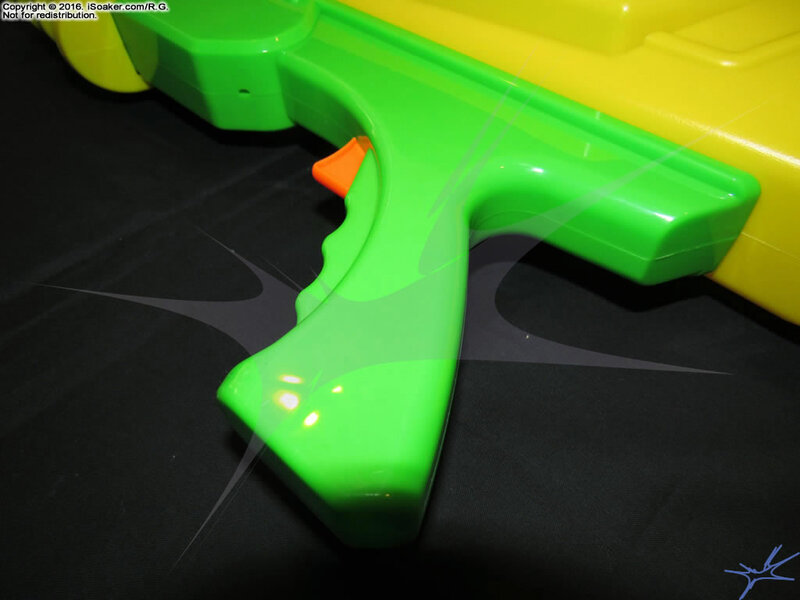 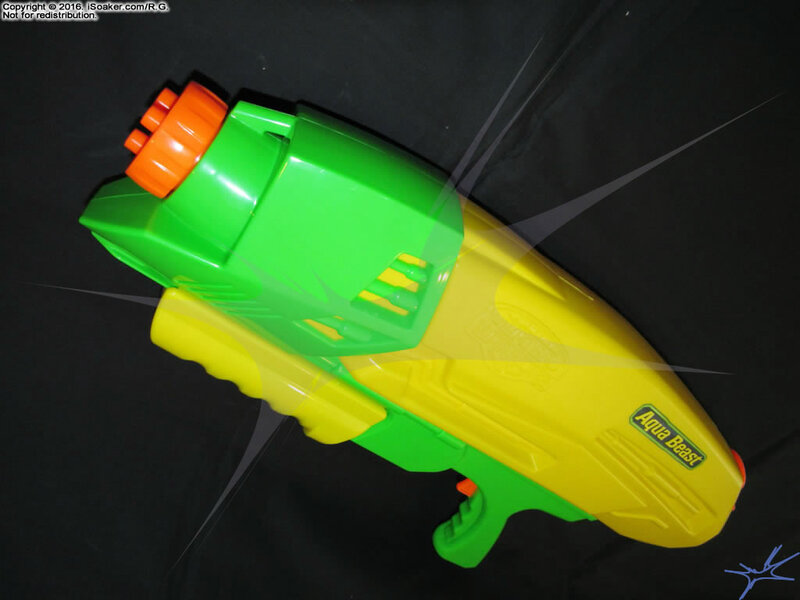 Featuring a nozzle selector with three settings and a reservoir that comprises the majority of the water blaster's overall size, the Aqua Beast offers "beastly" capacity. 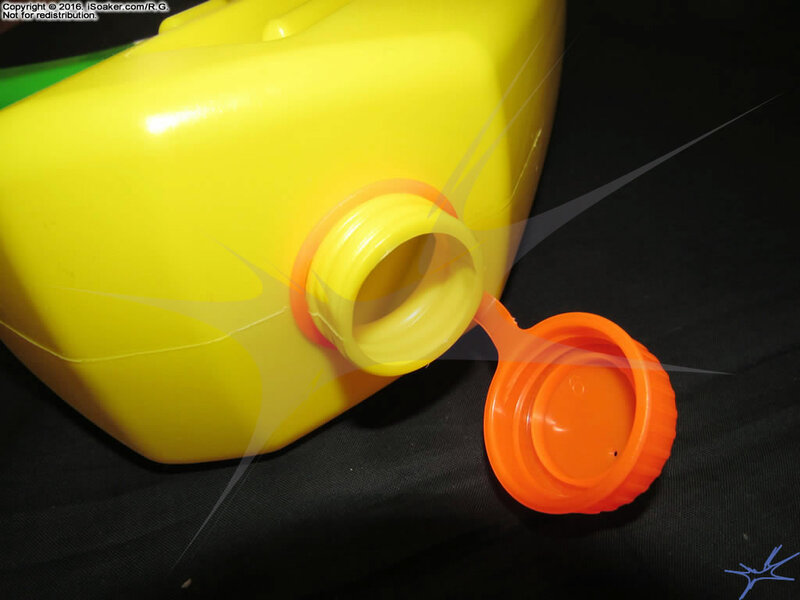 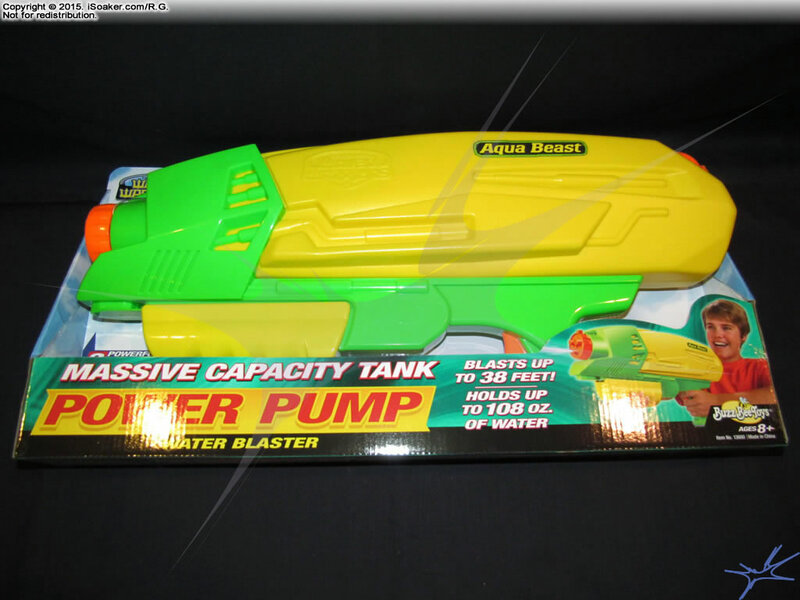 However, being pump action, creating prolonged continuous streams is not possible. 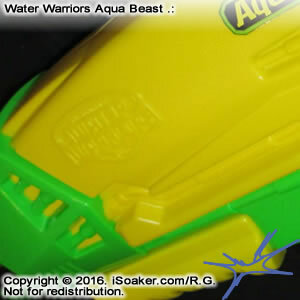 The Aqua Beast's look is large and chunky. 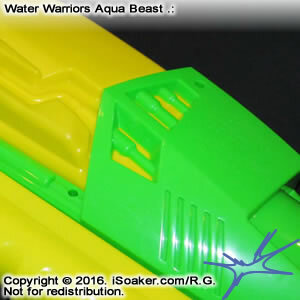 With some detailed sculpting on its body and reservoir sides, there are still a fair number of large, flat, single-coloured regions on the blaster, making it appear to be sparsely decorated. 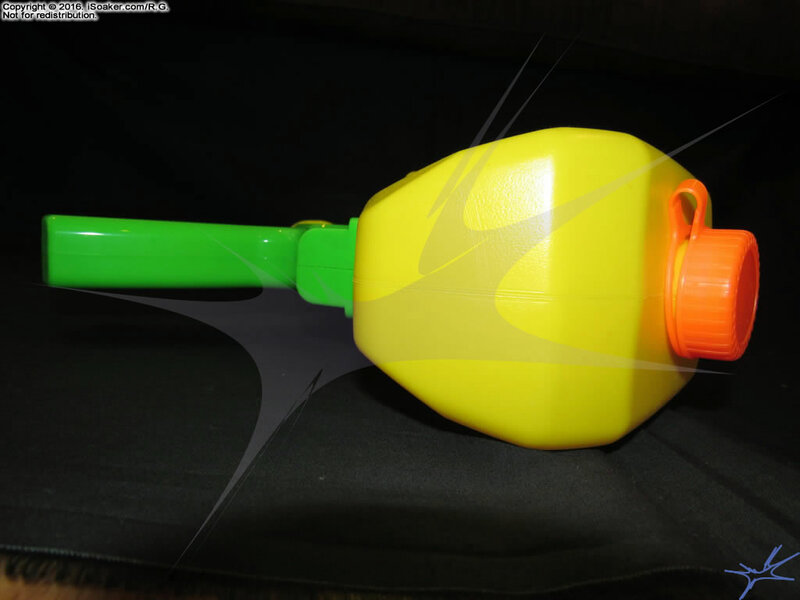 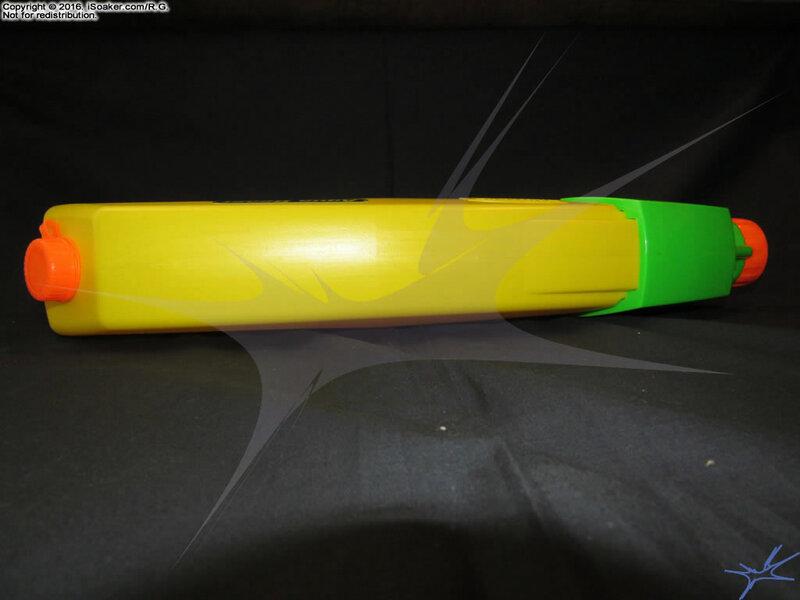 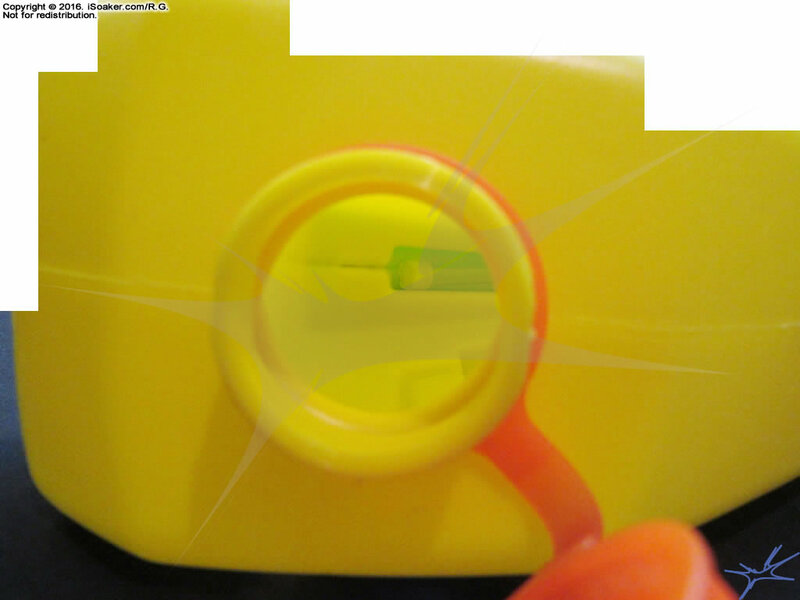 Its orange trigger is purely ornamental while its large grip and pump grip offer plenty of space to hold. 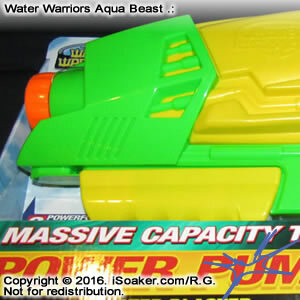 Due to its bullkiness and weight, particularly when completely filled, this blaster is aimed towards older, stronger users. 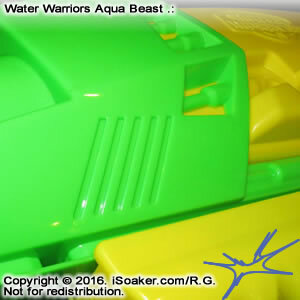 As noted above, the Aqua Beast has a nozzle selector with three settings, akin to the Water Warriors Avenger (2008), feature two stream settings and a burst setting (unlike the Avenger's fan setting). 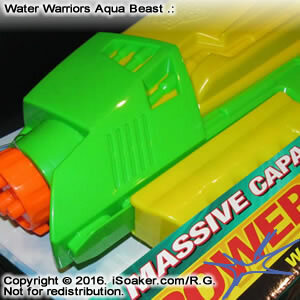 Interestingly, streams pushed from its largest nozzle were able to clear 40' (~12m) despite only having an measure output of a little over 1x-rating. 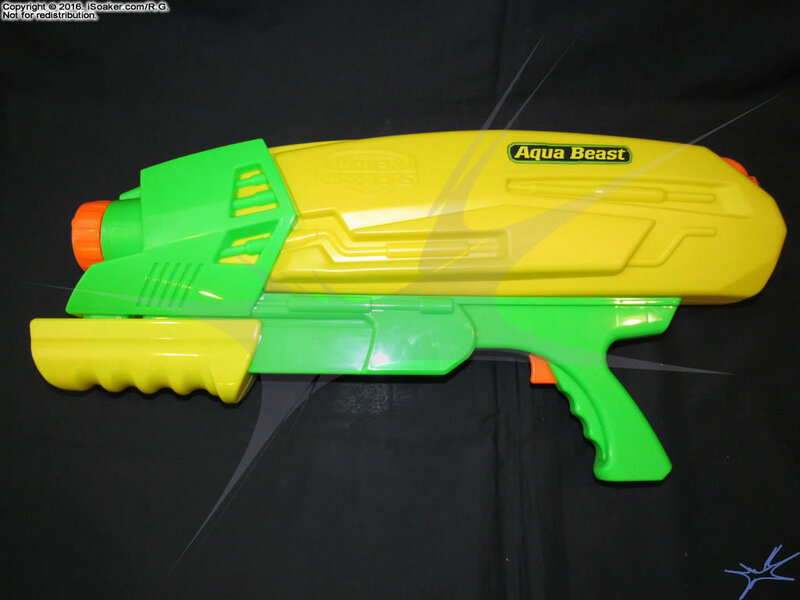 Despite having good range, being pump action, its average rate of fire (functional output) is lower than that of a truly pressurized water blaster. 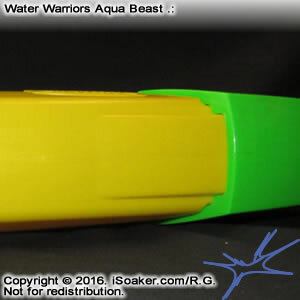 Suitable for small-to-medium-sized skirmishes, the Water Warriors Aqua Beast offers plenty of capacity and a nice selection of nozzles for the avid water warrior. 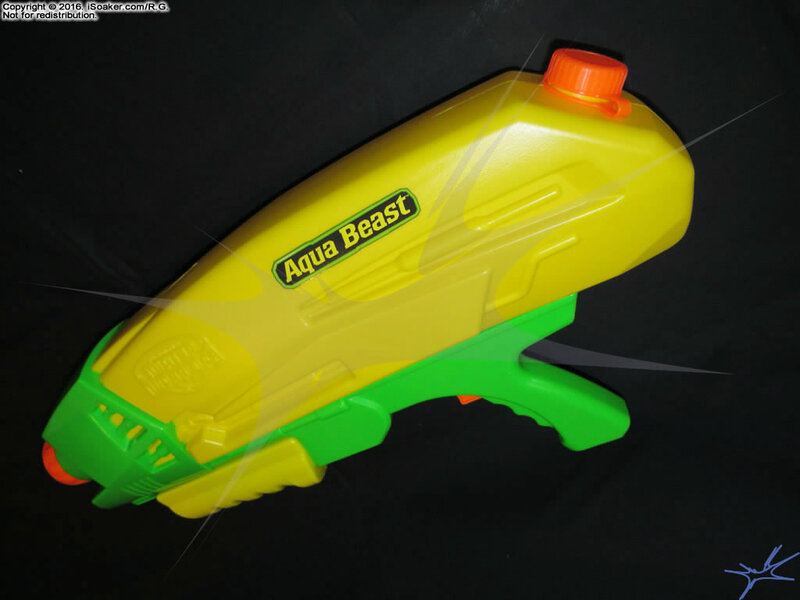 Simple to operate, the Aqua Beast is still outclassed by most air and elastic-pressure water blasters.